Miami Dolphins tackle Ndamukong Suh gave an emotional apology to his mother on Wednesday, appearing on TV after swearing audibly during the Dolphins’ Nov.8 loss to the Buffalo Bills. Questioned on their controversial star, the Miami Dolphins only issued a press statement saying that if they had possessed a tackle of Suh’s caliber in the 1980s that Dan Marino would have won a Super Bowl. 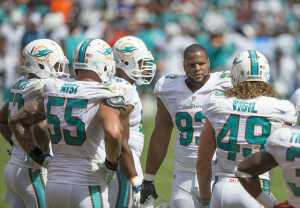 When asked if his team’s response was appropriate to such a notorious cursing episode, Suh showed pride and contrition.